Because I’m setup as a TrueBlue member through jetBlue, I am constantly getting emails regarding cheap flights, hotels, travel destinations and a million others telling me why I need to go on vacation right this minute. And when I say constantly, I mean multiple times a day! Normally, I just disregard these messages as mere junk, but I got one today that caught my eye. Brian Sousa and I used to frequent this town quite often and I love going back to visit family and friends that have moved out there. There’s that and the craps table I suppose. Anyway, when I saw that I could fly to Vegas for only $19, I was seriously considering going for two reasons: one, I’ve never flown to Vegas and two, it’s cheap. Boy, this is marketing at its best! Earlier this morning, I was working on current computer projects and planning my weekend when this email dropped in my mailbox. Now all of a sudden, I felt compelled to fly to Vegas. I guess it’s similar to when those savvy shoppers find a coupon for items at the grocery store, so they buy the goods because they can save money even though they don’t need the products! Logic tells us that if they didn’t buy the item (they don’t need) in the first place, they’d save even more money. Nevertheless, they reeled me in. Let’s move on to the point of my post. The first thing to note is that nowhere on here does it say what the $19 is for. I actually had to walk through the shopping cart process at jetblue.com to find out that this price was for one-way. I’m not a frequent traveler, so maybe I should know that these ads always state one-way fares, but would the average person know this? Secondly, it does clearly (albeit in small text) state that there are fees and restrictions. I scrolled down to the bottom of the email and found the regular stuff, valid on on certain dates, excludes Fridays and Sundays, cancellation fees, etc. The most interesting part were the fees. Normally, one could expect and even accept these fees as the cost of “doing business”, but come on!! Here’s the full terms as listed at the bottom of my email. $19.00 – Base fare price – This is the original starting price. 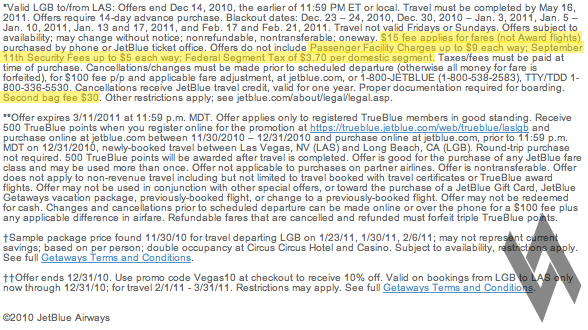 $15.00 – “Fare” price – This fee is not defined more than just being a fee tied to all fares per the terms. $9.00 – Passenger facility charge – This fee is charged for your use of the airports you depart from and arrive at. $5.00 – 9/11 security charge – This one covers all the latest security technology after 9/11 including full body scanning. $3.70 – Domestic segment charge – A ‘segment’ is defined as the takeoff and landing portion of your flight. 7.5% – U.S. excise tax (already included in the $19) – The government requires all airlines collect this fee and it must be included in all published pricing. If you’d like to fly back home, you can go ahead and double that charge. After all was said and done, I am able to fly to Las Vegas, NV from Long Beach, CA for a low price of only $103.40 even though I was offered the price of $38. What’s worse is I also have to fly on their terms which includes many flight restrictions and blackout dates. Of course I’m saving money because this price could easily cost 2 or 3 times more without the “special deal”, but my point was to show how fast hidden fees can add up. 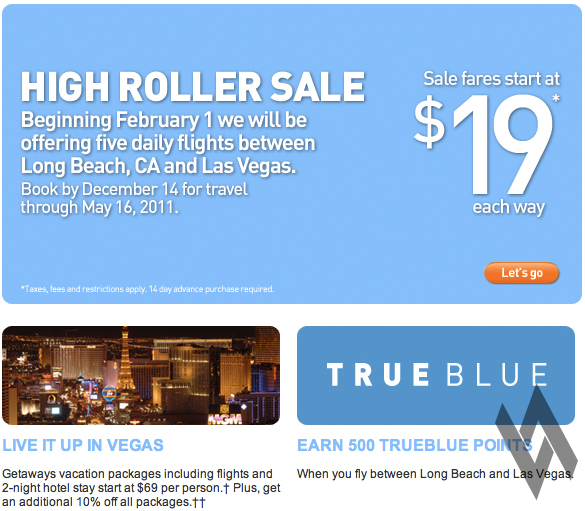 I’m thinking, wouldn’t it have been a better ad for jetBlue to just say, “Fly to Vegas for $100 round trip! Straight up. No fees.”? I never even talked about checking a second bag for $30 or the cost to cancel the flight for $100!! Or how about parking your car at the airport for about $10 per day?! And the rental cost of a car when you get there? Don’t forget the hotel, the drinks, the club admission fee (if you’re a guy), the dates with girls, the gambling, etc., etc., etc. When the weekend is over, you’ll be having flashbacks of The Hangover while wondering where all your money went! If you still want to have the flashbacks, but not the costs of flying and renting a car, just drive to Vegas. It will cost a lot less in gas money, plus you can go and come back whenever you want. Sorry to all those that live more than 300 miles from Vegas. 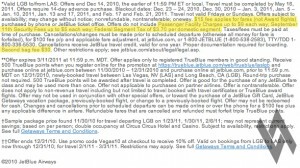 Air fare fees and information found on SmartTravel.com.